This post is a combination of extracts from The Life Of Sir Joshua Walmsley, By His Son, Hugh Mulleneux Walmsley. Chapman And Hall, 193, Piccadilly. 1879. and Thomas Burke’s ” Catholic History of Liverpool,” Liverpool : C. Tinling & Co., Ltd., Printers, 53, Victoria Street. 1910. Both are slightly partisan sources. Uncle Hugh’s biography of his father is uncritical to put it mildly, but it does quote his father apparently verbatim, which is nice. Tom Burke takes a pro-Catholic, and Irish Nationalist position, but that doesn’t detract from the power and polemic in his writing. Education, as with so many other things, was a hornet’s nest of politics, religion, bigotry, racism, and class. The Municipal Reform Bill of 1835 had resulted in a huge landslide vote for the Reformers or Whigs giving them a total of 44 councillors and 15 aldermen, against only 4 Tory councillors, and a single alderman. Until the Reform Act Liverpool had always been a Tory corporation. So it was a radical change. The first extract is Chapter IX of Hugh Walmsley’s book. On the eve of the termination of the reform council’s first year in office, [November 1836] when, according to a clause of the Municipal Reform Bill, sixteen of its members were to go out, Mr. Walmsley read a paper, entitled, ” What has the new council done ?” In it he passed in review the abuses that had been found prevalent, and the Acts that had been framed. Notwithstanding the difficulties with which it had to contend, the Council had effected a saving to the borough fund of ten thousand pounds per annum. In this paper he also expounded the system by which the Educational Committee had opened the Corporation schools to all sects and denominations. Let us glance at this act of the council, one that raised a storm in Liverpool, the like of which had not been known. Mr. William Rathbone and Mr. Blackburn took the lead in the movement. Mr. Walmsley devoted to it what time he could spare from the arduous task of reforming the police. The feeling that impelled the Educational Committee to advocate the adoption in the Corporation schools of the Irish system of education, was awakened by the spectacle of the multitude of children in Liverpool debarred from every chance of instruction. The report drawn up by the committee showed that besides numerous Dissenters, there were sixty thousand poor Irish Catholics in the town. The old corporation had quietly ignored this alien population, but threw open the doors of the Corporation schools to children of all sects, provided they attended the services of the Established Church, used the authorised edition of the Bible, and the Church Catechism. This virtually closed these schools against the Irish. The new council maintained that the State had the same responsibility as regards these children as it had towards others ; and the Educational Committee drew out a plan from that of the Honourable Mr. Stanley, Secretary for Ireland in 1831, [later Prime Minister three times as the Earl of Derby] Dr. Whately, and others, for the education of the Irish poor. Early in July, the committee laid its scheme before the council. The schools were to open at 9 A.M, with the singing of a hymn. 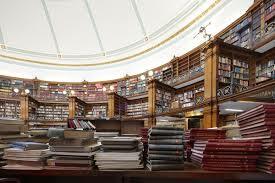 The books of the Irish Commission were to be used. Clergymen of every denomination were invited to attend at the hour set apart for the religious instruction of the children of the various sects. The town council unanimously adopted the plan and made it public. The storm now burst over Liverpool, and crowded meetings were held at the amphitheatre and elsewhere, to protest against the Act, and to promote the erection and endowment of other schools, where the un-mutilated Bible would form a compulsory part of every child’s education. In vain the council invited its accusers to come and see for themselves, the un- mutilated Bible forming part of the daily education. The cry continued to be raised by the clergy, and to be loudly echoed by their agitated flocks. As the period drew nigh for the November election to replace the retiring third of the council, the religious zeal of the town burned higher. To the imagination of frightened Protestants, theConservatives presented themselves in the reassuring role of ” Defenders of the Faith.” They played the part so well that seven Tories replaced seven of the sixteen Liberal councillors who had retired. Matters had now reached such a pitch that, at the next meeting of the board, Mr. Birch moved that the schools be discontinued, the property sold, and the Corporation trouble itself no more with the question of education. The proposition was so unexpected that the debate upon the motion was adjourned for a fortnight. By a large majority of votes, the council decreed that the mixed system should be continued in the schools. Thus the children silenced by their answers the cry raised against the mutilation of the Scriptures. The innocent replies proved better than could the ablest defence, in what spirit the Educational Committee had worked, and in what spirit their enemies had judged their efforts. Before separating, the audience who had been present, and who for the most part had come to criticise, united in passing a vote of thanks and congratulation to the Educational Committee for the work they had done, and for the excellent state of the schools. We have dwelt at some length on this attempt of the council to establish a free and religious scheme of education in Liverpool, for it was destined to prove the rock ahead on which Liberalism was to split. The following is from Tom Burke. The wording in brackets is from footnotes in the original; and he is calling the Reformers, or Whigs, Liberals, not a term they themselves would have used at the time. The differences were momentarily forgotten over the memorable fight for the schools at the November election of 1841. Somewhat prematurely the Liberal party announced that if returned to power they would build schools in every district of the town to be conducted on the same lines as the two schools already in existence. McNeill and his Tory followers paraded the streets with open [Life of William Rathbone, by Miss Eleanor Rathbone. ] Bibles attached to long poles, and strenuously appealed to the electors not to allow the erection of any schools unless Catholics and Dissenters would accept instruction from the authorised version of the Scripture. ” Converted priests “ harangued frenzied Protestant audiences, and were described by John Rosson, quoting Edmund Burke, ” as only qualified to read the English language,” and went on to say that as scholars they were ” despicable “ and as divines ” grossly ignorant men “ These Orange zealots forgot in their blind fury that the outcome of a Tory Protestant victory would be to force the Catholics to build schools for themselves, else they had never undertaken the campaign which aroused the worst passions of one section of the community and effectually destroyed for many years peace and harmony among the diverse sections which made up the Liverpool of the early forties. 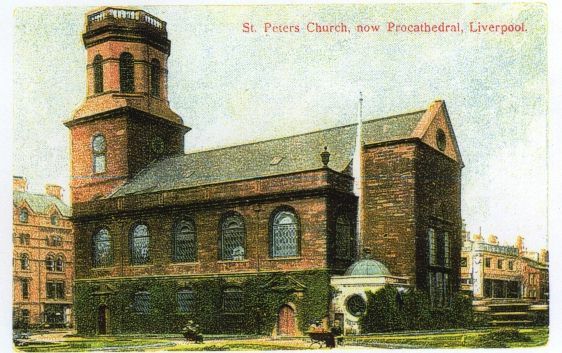 Wild stories were put in circulation of the ” murder “ of seven Protestant clergymen in Ireland, which so inflamed the Orange population of Toxteth that they smashed up an anti-Corn Law meeting in Great George Place, confusing, in their frenzy, economics with ” Popery.” They then marched to St. Patrick s Chapel, and shattered the windows of both schools and church. The wife of a policeman was saying her prayers quietly in the church when the infuriated mob made the attack, and, as the consequence, lost her life from fright, an incident which increased animosity on both sides. The Conservative party, emboldened by the strife, demanded that no prayers should be recited in the Council schools save those to be found in the Anglican liturgy, and that no teachers should be appointed outside those who professed the Protestant faith as defined by Dr. McNeill. A lady had been appointed a teacher at the North Corporation School, on the recommendation of the Protestant Bishop of Ferns. Coming from Ireland, her orthodoxy was suspected and the Conservatives in the Council refused to ratify the decision of the Education Committee. The Liberals declared that they declined to make religious belief a test, but had no objection to informing their opponents that the lady in question professed the Protestant faith. On this assurance, and for ” the maintenance of truth,” the Conservatives withdrew their opposition. They had, however, secured their object, the ” maintenance “ of religious controversy, and had so well succeeded that they fought the elections with an air of confidence, which was abundantly justified by the results. Then follow the signatures of the Rev. Dr. Youens (St. Nicholas ), Fathers Wilcock (St. Anthony’s), Thos. Fisher, O.S.B. (St. Mary’s), and Dale, O.S.B. (St. Peter’s). Councillor Smith proposed that separate schools should be provided for the Catholics in poor districts. The debate which ensued was characterised by truculency and tolerance. Unitarianism and ” Popery “ were regarded as convertible terms by the Conservative leaders, and in insulting and contemptuous language the Catholic claim to be regarded as citizens was flouted and rejected. Why the Unitarian body should have been singled out for reproach was probably due to the fact that the leading Liberals, with few exceptions, belonged to that community, and distinguished themselves not only by their entire sympathy with the cause of religious toleration, but gave many practical tokens of sympathy with the Catholics of the town. The Catholic children had no option but to withdraw from the Council schools, an action which gave intense satisfaction to the Tories, especially with regard to the North Corporation School. True to the course which had been mapped out beforehand, the Council schools were now turned into adjuncts of the Established Church, and all children in the Bevington Bush School were compelled to attend on Sundays and marched to the church service in St. Bartholomew’s, Naylor Street, unless the parents objected.” To mark his ” abhorrence “ of this policy, the Earl of Sefton sent a donation of twenty-five pounds to St. Anthony’s Schools, Scotland Road,[” Another kind of Town Councillor arose, who, with great pretension to religion, most irreligiously and unjustly, expelled from the public schools Catholic children by the hundreds.” St. Anthony’s Report, 1842.] and many other Liberals, including Sir Joshua Walmsley [ Mayor of Liverpool, 1839-40 ; afterwards M.P.] followed his example. The Catholic mind was finally made up. ” Schools of our own ! “ was the cry which resounded from every home as well as every pulpit. Thus the Tories of Liverpool may be styled the promoters of that magnificent series of Catholic schools which have sprung up in every quarter of Liverpool, to which came the teaching orders who lifted elementary education to the highest pinnacle of perfection. The bigoted Evangelicals did not anticipate such a result. Had they been far-seeing, instead of being blinded by rancour and partisanship, they would have seen that their policy would eventually bring about this result. What would have happened had McNeill not driven the Liberals from power is now an interesting speculation. Every ward in Liverpool would have had its Council school, and under the disinterested management of a Liberal Education Committee most Catholic children would have been in attendance. Mixed schools are not looked upon with friendly eyes by Catholics, but the success of a six years experiment, and the poverty of the labouring classes, would, in all human probability, have prevented the erection of purely Catholic schools for a generation. Where were the teachers to come from ? was the anxious query heard on all sides. The Government had made no provision for training teachers. Ireland came to the rescue, so far as the boys were concerned, and with the advent of the Irish Christian Brothers [The same work has been undertaken in Rome by the Irish Christian Brothers, at the express request of Pope Pius the Tenth. ] to St. Patrick s a new era of usefulness and charity was begun for that fine body of teachers. Later on they came to St. Anthony’s, St. Nicholas , St. Mary’s, and St. Vincent’s. Without payment or reward, save the voluntary offerings of the parents, these cultured men did a noble work for the poor children of their own race. To make them practical, earnest Catholics was their first aim ; to equip them for the battle of life was an easy matter for a body which had long distinguished itself by practical aims which have since disappeared from curriculums framed by more ambitious but less successful educationalists. For forty years they laboured in the town, and their departure under the pressure of the Act of 1870 caused widespread dissatisfaction. Quoting the full title of the old parish church was the unkindest cut of all; devotion to Our Lady or St. Nicholas not being a prominent feature of the principles of the unfortunate recipient of this well-merited castigation. The better educated members of the English Church heartily enjoyed Father Wilkinson s ready and apt reply. Church warden Birkett was snuffed out, and did not venture again into the fields of religious controversy. Liverpool had expanded hugely over the course of the eighteenth century, from a small fishing town with a population of 5,714 in 1700, to a 1,400% increase of population to 77,708 in 1801. The population more than doubled again by 1831 to 165,221. The vast majority was immigration from Ireland. The pressures this created on the need for housing, schools, and churches form a rather murky undertone to almost everything that happens in Liverpool, and particularly the politics. There are other strands as well, the abolition of the slave trade in 1807, the Corn Laws in 1815, a succession of poor Irish harvests in the 1820’s and 1830’s, the fight for Catholic emancipation leading to the Roman Catholic Relief Act 1829, and the fight for Parliamentary Reform. The following is largely extracted from Thomas Burke’s ” Catholic History of Liverpool,” Liverpool : C. Tinling & Co., Ltd., Printers, 53, Victoria Street. 1910. The wording in brackets is from footnotes in the original. ” The opening year of the nineteenth century witnessed a large influx of poor Irish people into Liverpool. One writer attributed the immigration to the passage into law of the Act of Union [Brook’s History of Liverpool.] which abolished the Irish Houses of Parliament, and provided for the future government of Ireland from Westminster. It is difficult to see how such an Act was directly responsible for sending the Irish of 1801 in large numbers to Liverpool, though it is certain that the result which ensued therefrom created the Irish Liverpool of a later date. 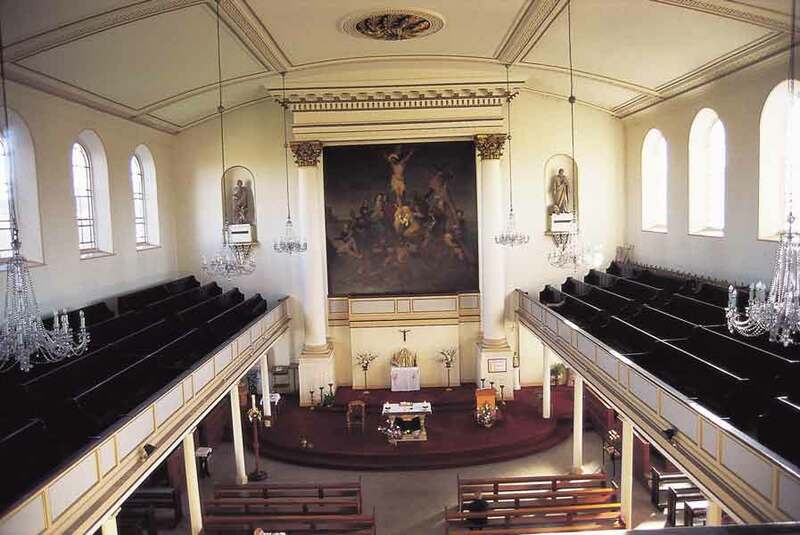 In the year 1821, the Catholic population, estimated by the numbers attending Mass on the Sunday mornings, was 12,000, as compared with a total seating accommodation of 56,200 in all the Anglican and Dissenting places of worship in the town. From a census taken in this same year we learn that the total number of houses occupied were 19,007, the average number of dwellers therein amounting to 5.84. More churches were needed. The next extension of church accommodation took place at St. Peter’s, Seel Street, the extended church being opened on November 27, 1817. In 1822, another influx of Irish immigrants arrived in the town, due to the severity of Irish landowners, who demanded their pound of flesh notwithstanding the generally depressed condition of Irish agriculture. The newspapers record the sequel in these words. ” Crowds of indigent poor sought relief at the workhouse in Cumberland Street, and at the parish church of St. Peter’s, Church Street.” It would be an interesting item of historical value could we calculate the heavy cost to Liverpool ratepayers of Irish misgovernment, and a no less interesting speculation would be the progress of Catholicism in Liverpool had Pitt failed in carrying into law the ill-fated Act of Union. This second exodus from Ireland to Liverpool must have been very considerable, as a local historian* tells us that around the Exchange not fifteen in a hundred were natives of the town owing to the numbers of poor Irish arriving daily. This immense mass of Catholics around the Tithebarn Street and Vauxhall Road area, entailed serious consequences social and economic to the town which have not wholly disappeared to this hour (1910), and brought about the erection of further chapels and schools, but for which the citizens of Liverpool had been brought face to face with insoluble problems of crime and lawlessness. Liverpool has failed entirely to realise its debt to the devoted Catholic clergy and the energetic Catholic laymen who saved the situation to some extent both in the twenties and the terrible years which were soon to follow. This Irish congestion had a curious sequel if we are to credit the statement that when the “cabbage patches “ which lined ” the road to Ormskirk,” had to give way to much needed sites for dwelling houses, the new street was called Marie-la-bonne, modified to Marybone, at the request of the Catholics ” who began to occupy the houses erected.”! Agricultural land now assumed a high value as ” eligible “ building sites, and brought in its train as a logical result the awful problem of housing the poor which perplexes local and imperial statesmen ignorant of the one method of solving the difficulty. St. Mary’s Chapel, just sixty-six feet long and forty-eight broad was sorely taxed to find room for the thousands who sought to hear Mass therein…… A similar state of affairs existed at the South end of the town. Seel Street Chapel was utterly unable to cope with the congested Irish population living in the streets off Park Lane and St. James Street, and a lay committee took in hand the erection of a new church to supply the spiritual needs of this Irish colony. The dedication of the church leaves no doubt as to the nationality of the poor for whom it was founded and quite a thrill of enthusiasm swept over the Irish population at the announcement that the Park Place Church was to be placed under the protection of the Apostle of Ireland. [Strong opposition was offered by the Protestant body to the erection, on the ground that there was plenty of accommodation already.] Touched by the needs of the Irish poor many of the leading Liberals gave substantial assistance towards the undertaking, and the poor contributed their mite generously and whole heartedly. The English Catholics of the town were generous to a degree and on the 17th of March, 1821, not many months after the project had been conceived, the foundation stone was laid amidst scenes of jubilation, probably never equalled since that memorable day. St. Patrick’s feast occurred on a Saturday that year, not the most suitable day for public rejoicings or processions, but the day mattered not, the heart of Catholic and Irish Liverpool was touched in its tenderest part, and a great procession was the result. Those were the days of great faith. Consequently the day was opened by the Irish Society attending Mass at St. Mary’s, a compliment to the parent church as well as a thanksgiving to God, and then reforming, the procession wended its way to St. Anthony’s, where the second half of the procession had also heard Mass at an early hour. Led by several carriages in which were seated the rector of St. Nicholas, Father Penswick, Father Dennet, of Aughton, and the preacher at the ceremony, Father Kirwan, St. Michan’s, Dublin, the monstre procession moved off on its long march to Park Place. Then followed the Irish Societies, wearing their regalia, bearing banners and flags, and accompanied by numerous brass and fife bands, including the Hibernian Society, Benevolent Hibernian Society, Hibernian Mechanical Society, Benevolent Society of St. Patrick, Amicable Society of St. Patrick, Free and Independent Brothers, Industrious Universal Society and the Society of St. Patrick. The last named organisation was founded specially to raise funds for the new church. Behind these organisations which comprised fifteen thousand men, marched the school children from the schools of Copperas Hill and the Hibernian School in Pleasant Street. That year the famous Irish regiment [Connaught Rangers.] whose exploits under Wellington in the Peninsular War were still remembered, was stationed in the town. On hearing of the proposed procession they expressed a keen desire to take part in it, and the Officer in command appealed to the War Office for the necessary permission, which was readily given. Their appearance in the procession, many of them bearing signs of their services to the King, aroused the sympathies of the liberal minded non-Catholic population and kindled the enthusiasm of their countrymen to fever heat. In the absence of the Vicar Apostolic who sent his blessing, Father Penswick well and truly laid the foundation stone, and amidst the jubilation ” of the thousands of English Catholics in the town ” and the plaudits of the immense crowd of native born Irishmen, the new mission was launched on its notable career. The festivities concluded by four public banquets held in Crosshall Street, Sir Thomas Buildings, Ranelagh Street and Paradise Street. Two years later the unfinished building began to be used and quite a surprise was felt by the average citizen at the strange and unique spectacle of hundreds of men and women kneeling outside the walls of the church on Sunday mornings, unable to obtain admission to the sacred edifice which was crowded to its utmost capacity as far as its condition permitted. Father Penswick, who was the head and front of the scheme for founding the church, made a herculean effort to finish the building. To this end he founded in his own parish an auxiliary branch of the Society of St. Patrick and raised a considerable sum of money. Many distinguished Irish ecclesiastics crossed over to Liverpool and preached in the still unfinished building; the Professor of Rhetoric at Maynooth one Sunday morning collecting two hundred pounds. Irish and English Catholics worked harmoniously until a foolish murmur was spread abroad that Father Penswick intended to put an English priest in charge of the mission and that he intended to frustrate the idea of the lay Trustees to make the ground floor of the church free for ever. This latter proposal, afterwards carried out, is a striking light on the poverty of the masses of the people at that time. An angry correspondence sprang up in the newspapers and retarded the collection of the needed funds, but eventually the rumours were dispelled by the appointment of Father Murphy. 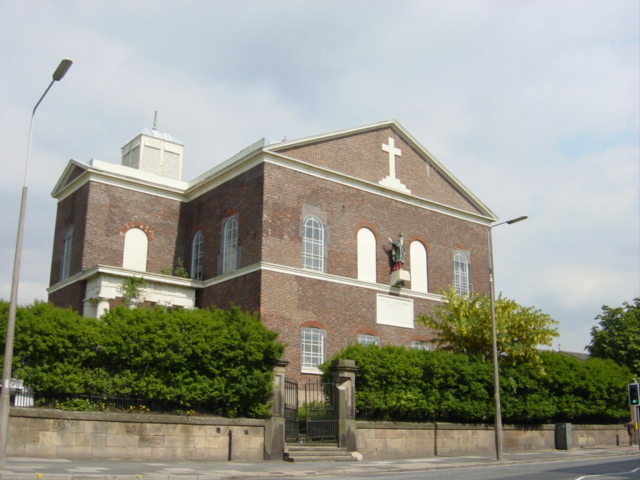 On the 22nd August, 1827, the church was opened by ceremonies of such splendour and solemnity as had never before been witnessed by Liverpool Catholics of any preceding age. 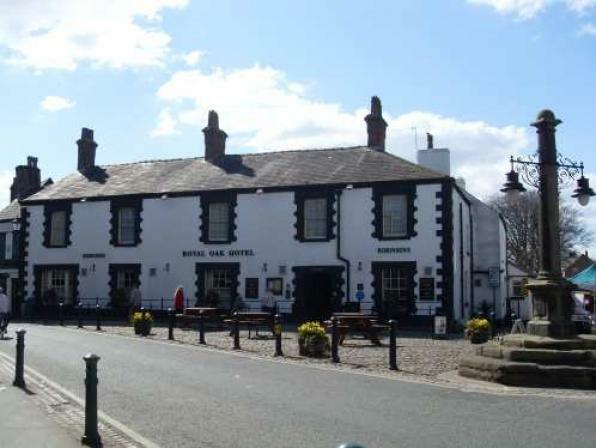 Over forty priests were seated in the chancel, coming from all parts of Lancashire and Cheshire. As a compliment to the founder of the church, Father Penswick was invited to sing the High Mass, an eloquent sermon being preached by Father Walker (later on one of the resident clergy), who had a high reputation as a pulpit orator. The amount collected inside the church on that day reached the large sum of three hundred pounds. The papers of the day paid special attention as usual to the musical portion of the service which was of a very high character, and specifically mentioned a young priest named White whose singing attracted much public attention. He had but recently returned from his studies in Rome and was asked by Pope Leo the Twelfth to join the choir in the Sistine chapel. This flattering offer was declined; the young Levite preferring the hard work of a mission in his native Lancashire to musical fame in the Eternal City. On the Sunday following the ceremony the church was opened free to the public as had been arranged by the Trustees; a stone laid in the outer west wall inscribed with this condition stands to this hour to perpetuate this curious condition. Mr. John Brancker, one of the noblest spirited public men of a generation remarkable for the high character and unselfishness of so many of its leading citizens on the Liberal side, had given generously to the funds for the church. He gave one special gift which against his own wishes told succeeding generations of his great charity. 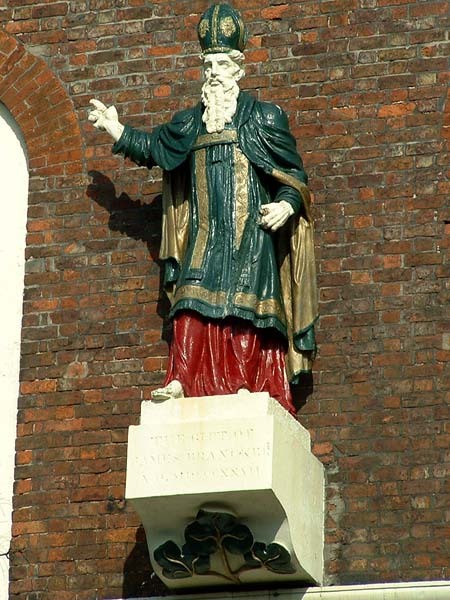 The fine statue of St. Patrick which stands outside the church was ordered by him from a Dublin firm of sculptors and placed in position in November, 1827. It has the distinction of being the first Catholic emblem displayed to public gaze in Liverpool since St. Patrick s Cross in Marybone had been destroyed. Thirty four years later in 1861, the future Mgr. Henry O’Bryen was the 3rd curate at the church. This is the preface to the ” Ackworth School catalogue : being a list of all the boys and girls educated at that institution, from its commencement in 1779, to the present period. “ published by Harvey and Darton, Gracechurch Street, London : 1831. If you have Quaker relatives, it is an absolute joy because it just lists all 5511 pupils who attended Ackworth School between 1779 and 1831, and the year they left. ” This small work may possibly fall into the hands of some persons little acquainted with the Institution to which it relates For the information of these is inserted the following slight sketch of its history &c extracted with slight alteration from a descriptive sheet accompanying a line Engraving of the School which was published a few years since. Ackworth School is situate between the villages of High and Low Ackworth, three miles south of Pontefract, in the West Riding of Yorkshire. The building is of freestone, obtained from the neighbourhood; and it was erected in 1757, 1758, and 1759, as an appendage to the Foundling Hospital in London. It cost £ 13,000; which sum was defrayed partly by voluntary subscriptions, and partly by aid of parliament.The house was applied to its original purpose, for twelve years, and afterwards remained unoccupied till 1777. In this year, it was purchased with eighty four acres of land, by Dr John Fothergill and three others, for £ 7,000; and in 1779, was opened as a public school for children of the Society of Friends, to which purpose it has been ever since applied. Various additions have been made to the buildings, and the landed estate has been increased to about 242 acres; the whole property being now estimated at about £ 30,000. The affairs of the institution are under the immediate management of the superintendent, resident at the school; but all matters of importance are referred to a committee of twenty eight friends, in the vicinity of Ackworth, and to another committee of the same number, who, with the treasurer, meet in London. The instruction of the children devolves on eighteen teachers. The boys are under the care of four school masters, with five apprentices; and five school mistresses, with four apprentices, have the charge of the girls. The regular branches of instruction are reading, spelling, writing, arithmetic, English grammar, and geography; but there are a few to whom the last two branches are not taught. Sewing, knitting, &c. of course form part of the employment of the girls. Many of the elder boys are introduced to an acquaintance with the more useful parts of the mathematics; and a class consisting of twenty of the most advanced, receive instruction in the Latin language. Besides attending to their school duties, the boys are frequently employed in farming, or gardening and the girls in various domestic occupations. There are three examinations of the children in the course of the year, the principal of which takes place at the time of the Annual General Meeting of the friends of the institution. 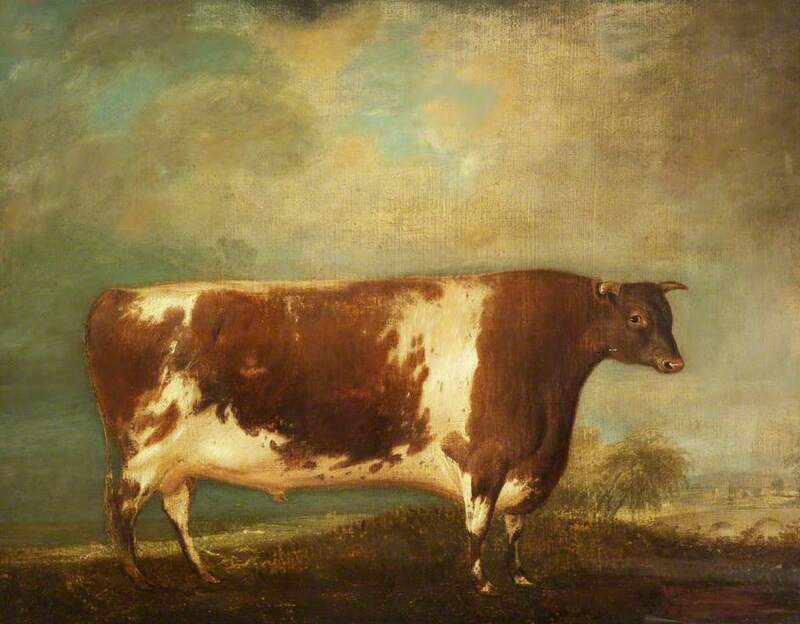 Garstang Agricultural Society was formed in 1809 with the aim of being “ useful and beneficial to the neighbourhood, ” and held its first exhibition in 1813. There were 13 prizes, “ premiums, ” for crops and stock, and 12 ” sweepstake “ prizes for stock. The following is from 1818.